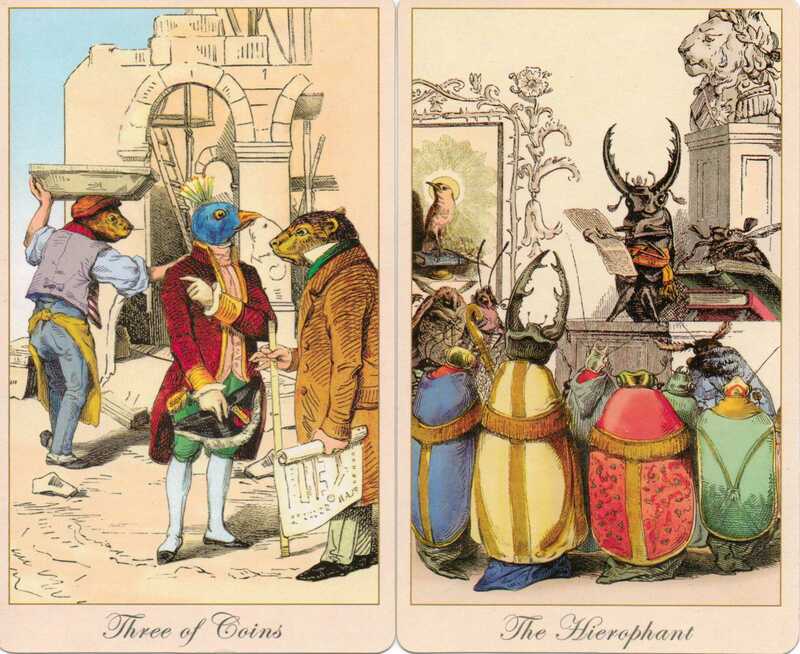 Today, I received the Fantastic Menagerie Tarot by Magic realist Press. What a quirky little deck! It is based on the drawings by J.J. Grandville and the images have a surprising amount to say. To help me get to know it a little better, I decided to use the BIT (Back in Time) technique developed by Janet Boyer. With this technique, you pick an event in your past and choose the tarot images which best capture it. So, without further ado, I decided to choose cards to represent my day at work today. The first card I chose was the Three of Coins. We had a member of staff ill and this card perfectly captured the rest of us trying to pull together and sort out how best to cover her absence. It is teamwork and collaboration in action. One of them seems very much in control and this made me think of our team leader who deftly stepped in and sorted us out. The second card is The Hierophant which typifies teaching for me. It represents me teaching the children. The Emperor came next and was chosen to show what was a fairly routine incident. In a typical day, I often have to sort out squabbles and disagreements between children. 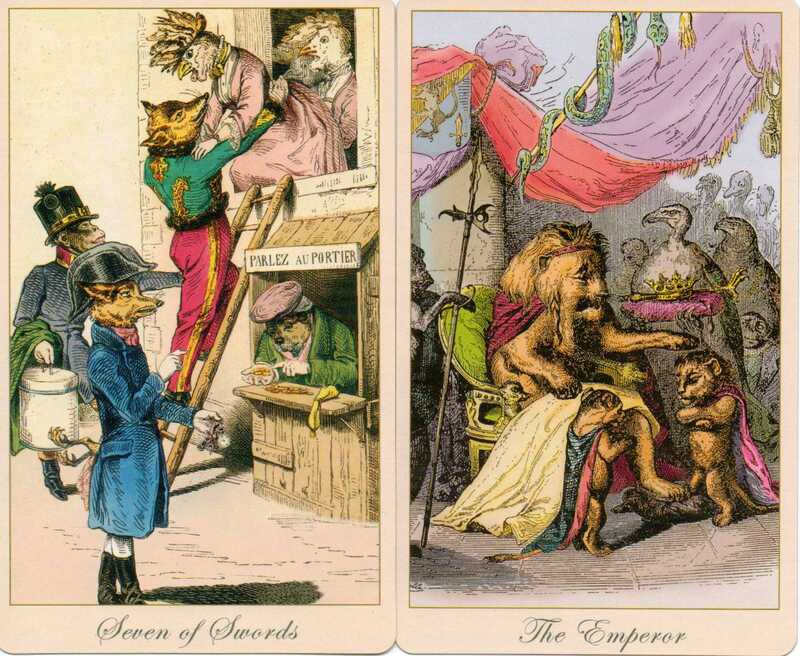 The emperor in this card is in charge but also seems to be impartial and trying to be fair. It reminded me that key skills of a successful emperor are being diplomatic, keeping the peace but also knowing when to take a firmer approach. This firmer approach tied in perfectly with the Seven of Swords. One of my pupils had been caught selling a banned item in the school playground. I saw him as the dog busy counting his money but also as the wily fox who is overseeing the whole process. This child is very streetwise and obviously saw an opportunity to make a fast buck! The final card is the Four of Wands which captured the class assembly at the end of the day together with its mood of celebration. 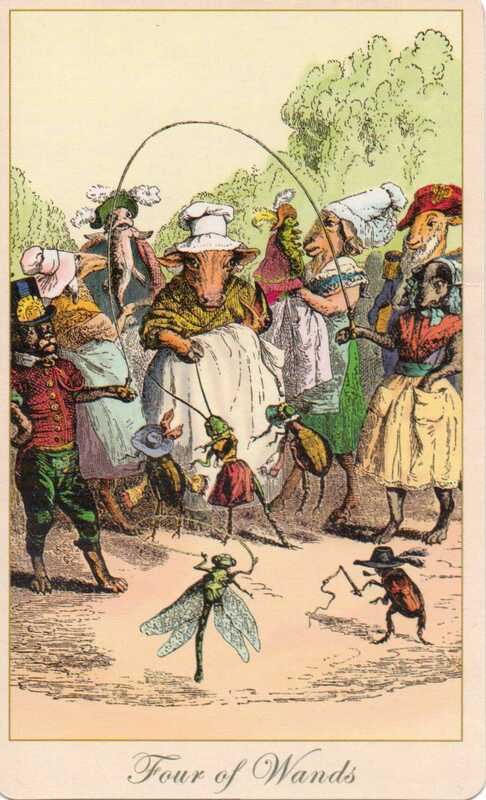 I see the little insects in this card as the children standing up on stage showing off their talents!